Anna Flowers Brotemarkle and Carol Jose, both Brevard authors, will host the Cape Canaveral Branch of National Pen Women's annual fundraiser to help their scholarship fund. Each year they award a scholarship stipend to a local college student studying in Letters (writing), Art or Music. This year, their luncheon speaker will be Bruce A. Smathers, whose father, the late U.S. Senator George A. Smathers, who grew up in Miami, Florida and graduated from the University of Florida, later donated the George A. Smathers libraries to UF, and also gave funds to Miami University in Florida for their library system. Bruce follows his father in service to his native state, Florida, and in leading the way in other charitable works. He is currently writing two historical books. You are invited to attend this luncheon. Cost is $25 per person, inclusive. 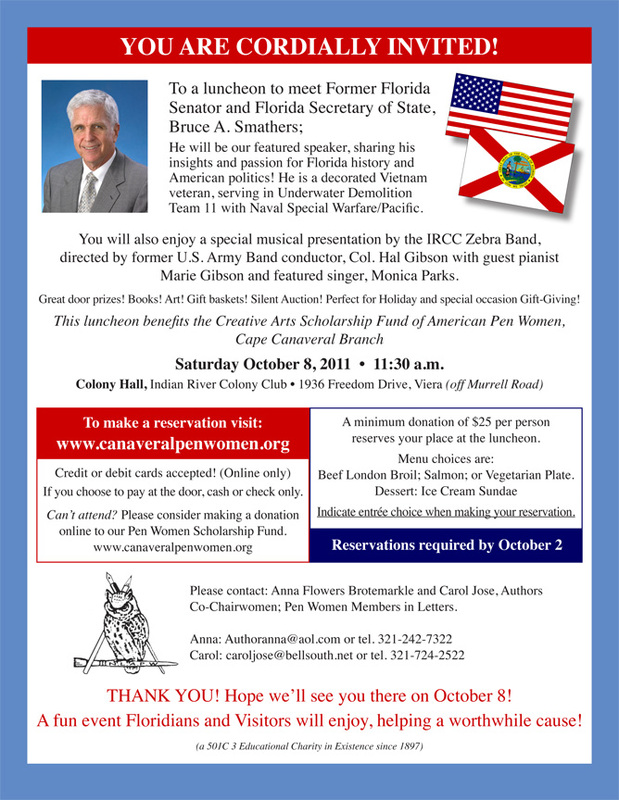 Reservations are required by October 2nd, and can be made on at www.canaveralpenwomen.org.